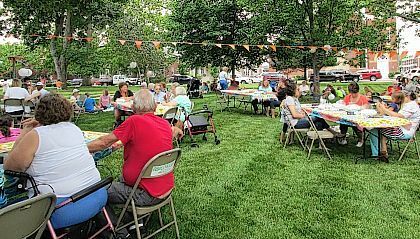 Area residents take a break for a midday meal and musical entertainment at the Greenville Public Library’s June Lunch on the Lawn, presented in partnership with Main Street Greenville. GREENVILLE – As summer approaches the halfway point, many of the vacations are over and families start wondering what to do. Greenville Public Library offers several ways for kids and adults to relax and be educated and entertained. For information on any of the library activities, call 937-548-3915. Programs often have limited space, so call ahead to reserve a spot. Story time for children is presented weekly at 11 a.m. on Tuesdays for children age 4 and older, and on Thursdays for children age 3 and younger. Lego Club for children age 6-11 will meet at 1 p.m. on July 16. Coming up in July is the “Life of the Union Soldier,” presented by Allen Coffman, a member of the Ohio Valley Civil War Association, July 16 from 6:30 to 7:30 p.m. Coffman will discuss what life was like for a Union soldier, what he carried and why. There will be a display of uniforms and a period-specific rifle and Henry Repeater. The Third Floor Film Series will show “The Treasure of the Sierra Madre” on July 23 at 7 p.m. This classic psychological thriller explores greed and desperation set against the barren hills of the Sierra Madre. Popcorn, candy and soft drinks will be provided free of charge, and there will be a discussion after the film. The first meeting of Poetry Matters, the library’s new poetry appreciation group, will be July 24 at 2 p.m. Participants should bring along books or other material containing already published poetry that matters to them for discussion in the group. On July 30, from 6:30 to 7:30 p.m., will be a book signing and presentation by author Jesse Berry on his debut novel, “Chan, Tea and the Way of the Warrior.” Berry, owner of Blue Lantern Tea and Young Forest Martial Arts Ltd., will demonstrate the Kung Fu Tea Ceremony and talk about his martial arts background. The book will be available for purchase and signing. Light refreshments will be provided. The Adult Summer Reading Program continues through July 31 for adults 18 and older. Register at the library and every book, audio book, e-book or magazine checked out counts as one entry into the weekly drawing for prizes. There’s one more Lunch on the Lawn planned, which is presented in partnership with Main Street Greenville. On Aug. 7 from 11:30 a.m. to 1 p.m., entertainment will be provided by Higgins Madewell and box lunches, $7 each, will be provided by Romer’s Catering. The film series presents “The Cincinnati Kid” Aug. 13 at 7 p.m. Steve McQueen stars as a young hotshot in the world of high-stakes stud poker in Depression-era New Orleans squaring off against the reigning king of poker, played by Edward G. Robinson. On Aug. 17 from 6 to 7:30 will be the first meeting of the brand-new book club at the library, Bookish. The first book is “Everything I Never Told You,” by Celeste Ng. Those who would like to participate should email the group’s founder, Melinda Guerra, at gplbookclub@gmail.com. Beyond the books, there is even a Growing Harvest Seed Library, with donated seeds for gardening at home and the Knitters club meets every first and third Tuesday of the month from 2 to 4 p.m.